The MANOOVR Multi-PL is the latest generation of Nooteboom semi low-loaders. Unique features are the ultra-low floor height and the high maximum permissible axle load. The combination of a floor height of 780mm with at least 12 tonnes per axle line throughout Europe – including the Netherlands – makes the MANOOVR exceptional. At the next BedrijfsautoRAI, taking place from 20 to 24 October in Amsterdam, the MANOOVR Multi-PL will be launched as a world first and is bound to be the centre of attention at the Nooteboom stand. The MANOOVR Multi-PL generation proudly bears its name: up to 70 degrees steering angle makes manoeuvring a real treat. In order to ensure optimal steering behaviour – in extended or retracted position – the steering can simply be adjusted when extending. To adjust the steering it is no longer necessary for the driver to go underneath the trailer. The lock pin is now located above the floor. Changing the position of the lock pin determines which of the front axles will be steering with the tractor (when the trailer is retracted), will be rigid or indeed steering with the rear axles of the trailer. Simple but effective and the outcome is amazing: whether extended or retracted, the trailer will track the tractor perfectly and as a result tyre wear is kept to a minimum. If a Multidolly is used the Multi-PL also offers the option to hydraulically adapt the steering of the Multidolly in order to guarantee optimal steering behaviour in extended or retracted position. These adjustment options also reduce the road drag, which will save on fuel. The MANOOVR technology was designed to ensure a long life and minimal maintenance costs. With fewer pivots in the steering and suspension the susceptibility for maintenance and wear is minimal. Every axle is mounted on the trailer by means of a tower bearing of a completely new design. This extremely clever construction keeps the trailer low, but it is also a strong and robust axle mounting. In abnormal transport the costs of replacing the tyres accounts for a large part of the total costs. With the MANOOVR the wheel stays in the same position whatever the situation. Whether the wheel is steering inwards or at a different ride height: the wheel is always perfectly aligned. Of course tyre wear depends on the usage, but with average use the tyres will last for at least 300,000 km. 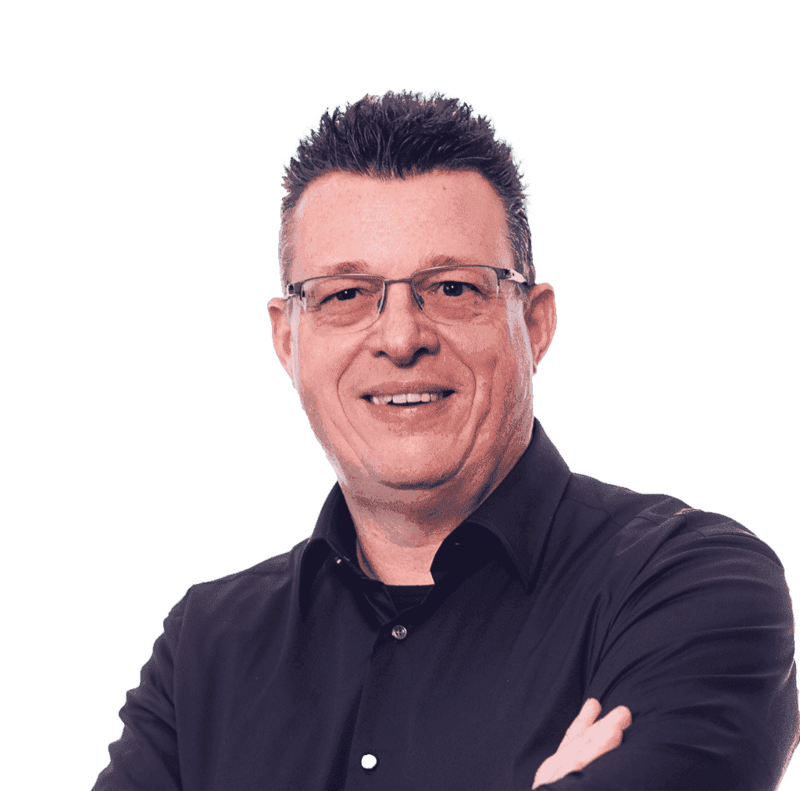 Taken over the total life of the semi-trailer, the tyre costs of the MANOOVR will often be lower by tens of thousands of Euros compared with a semi-trailer with independent suspension. Many details on the MANOOVR Multi-PL have been renewed. For instance, the ratio between the fifth wheel load and the weight on the frontmost axles of the trailer can be adjusted hydraulically. A 30-tonne gooseneck goes steplessly from 18 tonnes for a 6×4 tractor to 30 tonnes for an 8×4 tractor at 12 tonnes per axle line on the frontmost axles. The adjustment operates via two vertical cylinders in the neck construction. Attention has also been paid to improve the ergonomics and safety. The controls are logical, simple and centrally located underneath the gooseneck. An important element for safety is the stability of the trailer, especially with loads that have a high centre of gravity. Normally, when driving, the trailer will be in the 3-point support position, which provides maximum compensation between the axles. At low speeds the 3-point support can be changed into 4-point support, which gives even more lateral stability when manoeuvring. This hydraulic control makes it much safer to manoeuvre with a heavy load that has a high centre of gravity. The MANOOVR Multi-PL generation is at the launch available with 3 to 10 axles. The load floor is single, double or triple extendible. The gooseneck is available in a 25-tonne or 30-tonne version and the MANOOVR Multi-PL is available in widths of 2,550mm or 2,750mm. In the future the MANOOVR technology will also be applied within the Nooteboom low-loader programme. There are some persistent preconceptions about pendle axles and independent suspension. 1. Semi-trailers with independent suspension have 12 tonnes per axle. This is NOT TRUE. 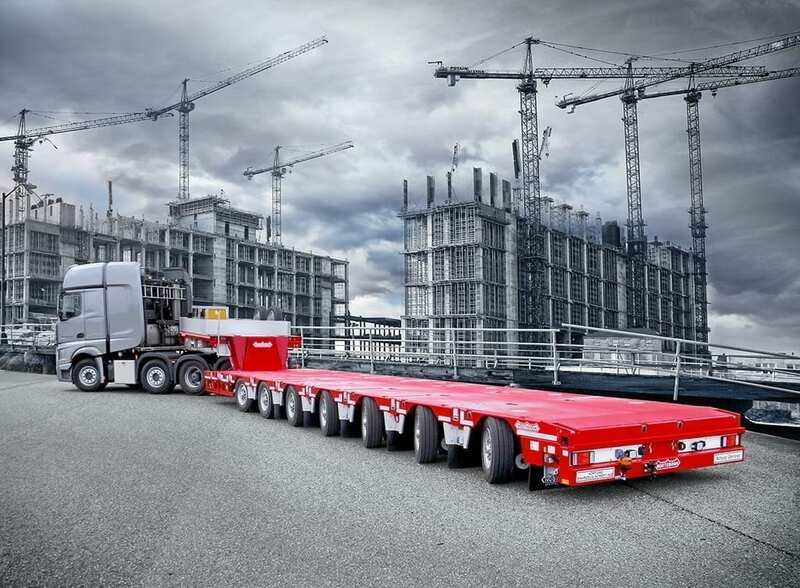 In some countries the maximum axle load is the same for pendle axles and independent suspension, but in a number of countries, including the Netherlands and France, there is a difference. In those countries the MANOOVR has 2 to 2.5 tonnes more load capacity per axle line. 2. Pendle axles keep tyre wear to an absolute minimum. This is TRUE. The ride height does not affect the position of the wheels. The perfect alignment, suspension travel and steering angle of the pendle axle means tyre wear is much less than on a semi-trailer with independent suspension. This is NOT TRUE. 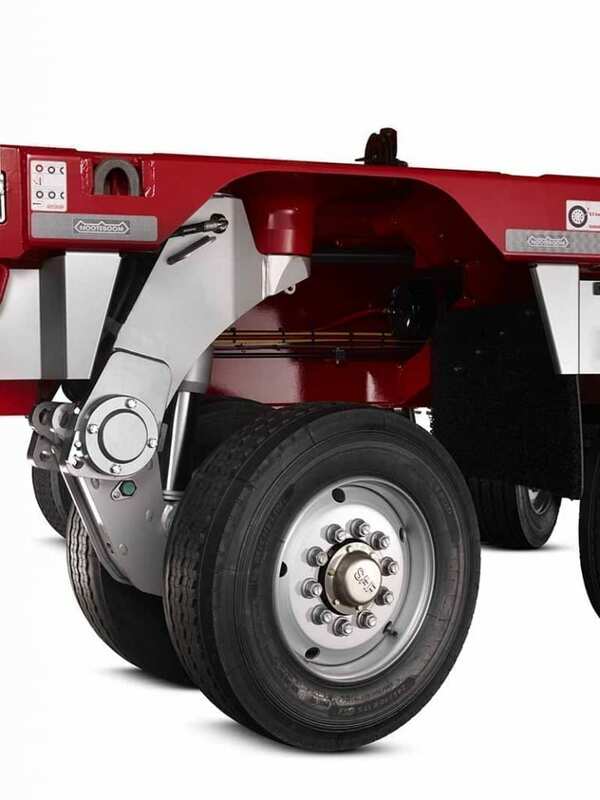 The pendle axles and steering of the MANOOVR have up to 50 % fewer pivots for steering and suspension compared with semi-trailers with independent suspension. And what’s more, the pivot bushing is completely maintenance-free. 4. Semi low-loaders with pendle axles are heavier than those with independent suspension. This is NOT TRUE. Mounting pendle axles with the unique MANOOVR technology makes it possible to install a very high central beam. This central beam can therefore be much lighter and still have the same strength c.q. torsional stiffness. This lightweight construction together with the simplicity of the pendle axle construction results in a very favourable dead weight of the MANOOVR Multi-PL, which is therefore definitely not heavier than a the semi low-loaders with independent suspension. The Koninklijke Nooteboom Group will celebrate its 135th anniversary next year. During that long history many important developments for heavy transport took place in the Nooteboom drawing office. The Eurotrailer opened the European market for Nooteboom in 1984. The EURO-PX, introduced in 2005, guarantees the lowest possible cost per kilometre in the heavy transport sector. And 2015 is for Nooteboom the year of launching the MANOOVR technology. Revolutionary, durable, robust and innovative. But above all: a simple construction. Various customers have already bought the new MANOOVR Multi-PL unseen. Based on the extremely favourable specification and the reliability of Nooteboom the choice was not a difficult one. The MANOOVR: looking to the future and designed for maximum usability and lowest costs per kilometre!